Stuck at the airport? Instead of constantly refreshing your phone for flight updates, head over to the vending machine — not for packaged cookies or soda; but for fresh salad, cosmetics, or even local artwork. Dining and shopping options at most airports have, thankfully, undergone major makeovers the past few years, bringing gourmet meals and upscale goods to terminals nationwide. Now airport vending machines get their chance to shine, with new offerings far more interesting than the stale candy and cigarettes of days gone by. In both Oakland International and Kansas City International Airports (and an east coast airport about to be announced), vending machines from SouveNEAR dispense a charming, curated selection of locally sourced, artist-made objects ranging from art, jewelry, and t-shirts to gourmet food and fun stuff for kids — day or night. “The small footprint [of a vending machine] gives us an opportunity to be in more spots within an airport so it’s easier for people to find us,” said SouveNEAR cofounder Suzanne Southard. And, buying art from a vending machine is just “fun,” she added. To deliver power to hungry smartphones and gadgets in transit, FuelRod vending stations in almost two dozen U.S. airports and a couple of international ones dispense portable chargers for around $20 that can be swapped out repeatedly for a fully charged replacement in another airport or in a variety of malls, hotel lobbies, convention centers, and theme parks. And, starting last month, passengers at Chicago’s O’Hare International Airport have been able to purchase fresh salads and healthy snacks in clear, recyclable jars from the Farmer’s Fridge vending kiosk on Concourse F in Terminal 2 (next to a shoeshine stand). Two additional Farmer’s Fridge kiosks are scheduled to be installed at O’Hare’s Terminal 3 by the end of December. Like the company’s 50-plus vending machines in town, the Farmer’s Fridge kiosk at O'Hare has a touchscreen menu offering a selection of meals made with organic and locally sourced ingredients for between $7 and $12. The machine is restocked nightly during the week, with unsold items pulled and donated to area food pantries, said Farmer’s Fridge spokeswoman Beth Somers. “On weekends the machine’s smart technology only allows it to sell food items, such as trail mix, that have a longer than one-day shelf life,” she said. 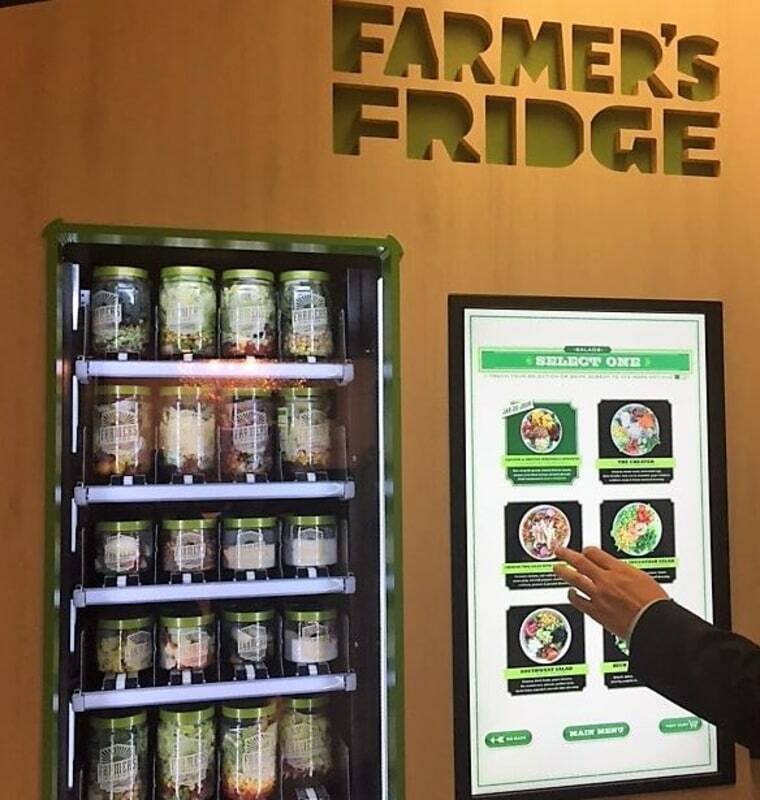 Beyond the novelty of selling salads from a machine, the Farmer’s Fridge concept could catch on because, like the ZoomSystems retail machines now offering passengers Best Buy, Benefit Cosmetics, and other products in airports, automated retail can monetize various corners and sections of airports, said Ramon Lo, publisher of Airport Revenue News. Lo can see the salad-vending concept spreading to other airports. “I wonder if Farmer’s Fridge could customize the offerings in the machines to match the regions they’re in. Like maybe a BBQ salad at Dallas/Fort Worth International Airport,” he mused. Harriet Baskas is an NBC News contributor who writes about travel and the arts.